Bran Castle, situated between the Bucegi and Piatra Craiului Mountains, 30 km far from Brasov, is the only touristic point that attracts hundreds of thousands of tourists because of a legend: Count Dracula’s Legend, although the historical sources state that Vlad Tepes (Vlad the Impaler) dropped by only once, in his way to Brasov. Initially, the Bran Castle (in Slavic „brana” means „gate”) was a stronghold known as Dietrichstein, built by the Teutonic Knights in 1212, stronghold that was conquered by the Saxons living in Transylvania towards the end of the 13th century. The first documentary attestation dates from 1377, when Ludovic I D’Anjou gave the inhabitants of Brasov the privilege to build the citadel in the place of the old stronghold. Then, between 1419 and 1424, it was in Sigismund’s possession. At the end of the 15th century, it was subordinated to the authority of the Szeklers Committee, and since the reign of Iancu of Hunedoara, it passed under the rule of the Voivode of Transylvania. On 1st December 1920, the Bran Castle was donated to Queen Marie of Great Romania, as a symbol of the inhabitants of Brasov’s gratitude for her contribution to the achievement of the Great Union of 1918. Right after that, the Castle came into a seven year restoration period under the guidance of the Royal Court architect, Carol Liman. He imagined the architectural ensemble as a summer residence. 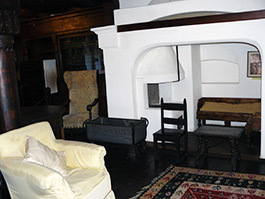 During the same period of time the Tea House was also built. During this restoration works, the Castle was supplied with running water from a 57 meters depth fountain dig up in a rock and lighted by a turbine electric power plant. Later, in 1932, the Bran, Simon and Moeciu villages were lighted on from this electric power plant. 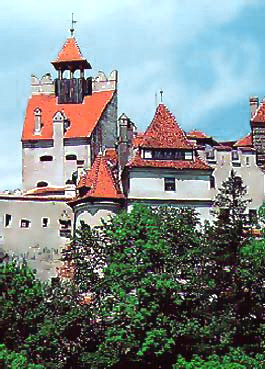 Then, in 1938, Queen Marie left with will the Bran Castle to Princess Ileana, who owned it until 1948. After King Mihai abdicated and the Royal House was expelled, the castle became the propriety of the state, being abandoned and devastated. Only in 1996 was it restored as a History and Medieval Art Museum. In 1987, the restoration process of the castle began and was finished in 1993. In 2006 the castle was retroceded to Dominic of Habsburg, Princess Ileana’s successor. In the winter of 2007, the new owner set it on sale. Due to the fact that the District Council of Brasov wanted to buy back the castle, the lawyers that were dealing with this transaction asked for the price of 60000 euro. After an investigation performed by a parliamentary commission, the conclusion drawn was that the retrocession of the castle to Dominic of Habsburg was not carried out obeying all the legal procedures. 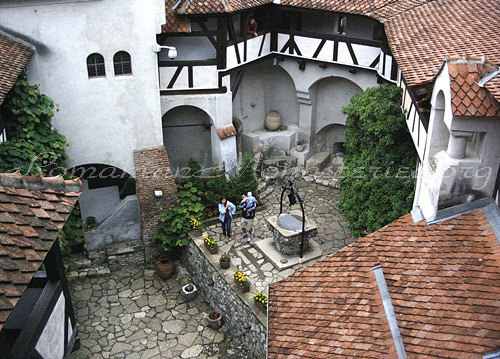 In the end, Bran Castle has become officially Dominic of Habsburg’s propriety since 18th May 2009, when the lawyers of the Habsburg House and the leadership of the museum signed the proceedings that stipulate the fact that the castle belongs to Dominic. 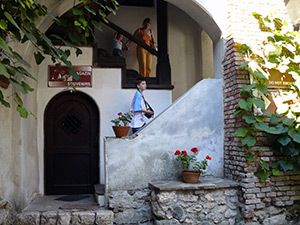 Being Queen Marie’s nephew and Princess Ileana’s son, Dominic of Habsburg acquired Bran Castle nearly after 6 decades, as his family was forced to leave the country by the Communist Regime. He was only 10 years when this happened. 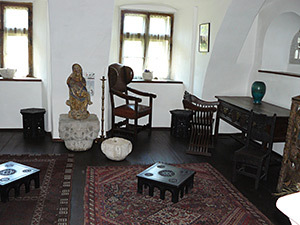 After the Minister of Culture and Cults has withdrawn most of the items from Bran Castle, these have been eventually replaced by furniture pieces that used to belong to the Habsburg family. The most valuable ones are The Crown, the Sceptre and a golden dagger and they all belonged to King Ferdinand. We might mention also a portrait of Princess Ileana with her signature upon it, a bed cover, several furniture items and a guest book that belonged to Queen Marie. The certain book was offered to her in 1920 by the community from Brasov and contains the impressions of all personalities from the country and abroad that had passed the threshold of the castle during nearly three decades. 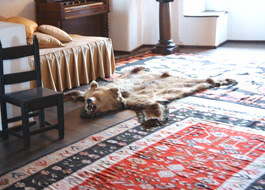 According to an official of the Bran Castle administration, there will be made certain changes in the castle. A projection hall with the images of the National Film Archives about the history of the royal family and the castle will be arranged. 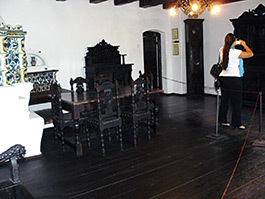 Also, a room dedicated to the costumes of the royal families and a dining-room will be arranged. 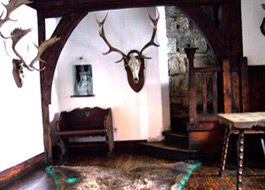 Further more, in the Round Tower of the castle a luxurious apartment will be made for the tourists that want to spend the night over Bran Castle. Also, the owners of the castle intend to restore Queen Marie’s Tea House which is situated in the enclosure of the Bran domain. It is desired that the Tea House to be a public attraction. 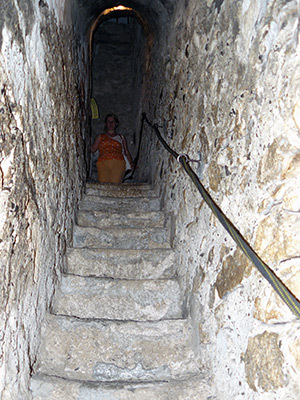 During the restoration of the castle from Queen Maria’s time, a secret stairs, who connects the 1st floor with the 3rd floor, was discovered in the east tower. 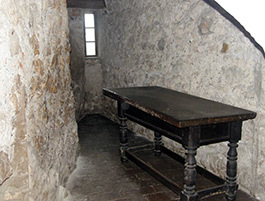 There is one chamber in the castle dedicated to Bram Stoker, where the legend of Vlad Tepes (known also under the name of Vlad Dracul) and the myth of Dracula are presented. 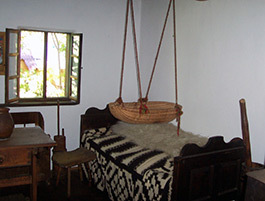 In the court of the Castle there is a village museum presenting the life of the peasants in the area, the work and customs from the Rucar – Bran area. 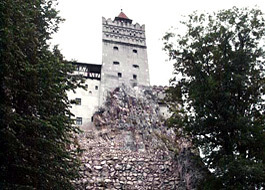 The Bran Castle is the destination preferred by American and British tourists for Halloween. A new tourist attraction offered by the new owners is represented by the 10410 bottles of Merlot de Dealu Mare, known under the name of “Chateau Bran” since 2007. A bottle costs 45 lei. There are also 1377 bottles of Cabernet Sauvignon (a bottle of this kind costs 160 lei and it is “ennobled” with the words:” Reserve de l’Archiduc” and “Dominic” signature”. Both types of wine will be commercialized only at Bran Castle, under the name of “Chateau Bran”. The American magazine “Forbes” has placed Bran Castle on the 2nd position among the most expensive estates in the world, being estimated at 140 million dollars. 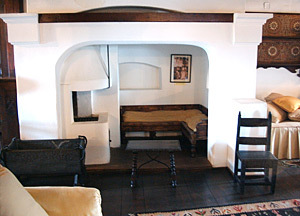 Bran Castle – inside of a room. Where does Count Dracula’s Legend come from? The writer Bram Stoker, who published in 1897, in London, the novel “Dracula, the vampire from Carpati” is the one who created the fame of the Castle associated with Dracula. Literary critics consider the book as being mediocre, but it had a great impact upon the readers, as six editions were printed before 1903. 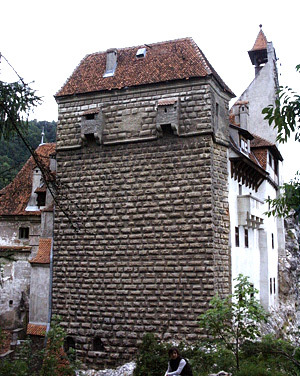 Otherwise, Stoker does not determine exactly the place of the castle in his novel, but some historians state that it was in the Bargau Area, on the mountain pass between Transylvania and Moldavia. 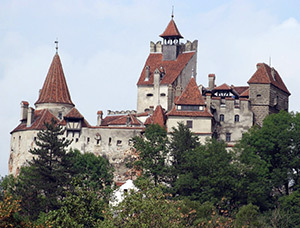 Anyway, it is certain that, because of this novel and of the film versions of the novel, it was created an indestructible connection between Dracula, the Bran Castle and Transylvania. In fact, the legend of the bloody count called Dracula was not associated with Vlad Tepes (Vlad the Impaler) until the 19th – 20th century. This superposition of images is due to the fact that the Romanian ruler was known as pitiless with those who did not obey him or who broke the laws, and the most frequent punishment was the impalement. Another explanation of the name, Dracula, could be represented by the fact that in 1431 Sigismund of Luxembourg invested Vlad II, Tepes’ father, with the Order of the Dragon, a chivalric order dedicated to the wars against the Turks, and whose emblem was a dragon, commonly associated with the symbol of devil. It seems that this is the reason why Vlad Tepes was called Vlad Dracula. Otherwise, the Bran Castle is not the only touristic point connected with this legend. Another place mentioned when speaking about Dracula is Snagov Monastery. 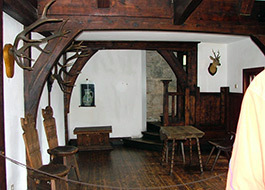 Bran Castle – souvenir shop. PHOTO FEE IS INCLUDED IN TICKET!! Professional filming / photography is allowed in after signing a contract. Their charge is based on the customized offer. According to statistics, over 385.000 tourists visited the Bran Castle during the last year, and 100.000 of them were foreigners. There are various possibilities for accommodation. The Bran village is considered to be the place with the greatest number of boarding houses. One has to pay between 60 and 150 lei for a room. Some of the boarding houses also offer to the tourists traditional dishes, as ewe cheese with polenta, fried pork meat or milk and maize. 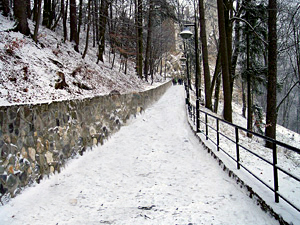 The way to the entrance in Bran Castle. If you come from Bucharest and go to Brasov, you have two possibilities: one is the highway 73A (Paraul Rece – Rasnov), that is a fork in the European highway 1 before Predeal, and the other is the national road 73, from Brasov. Every half an hour there are buses from Brasov to Rasnov, Bran and Moeciu. It takes an hour to arrive at Bran, and ten more minutes from Bran to Moeciu de Jos. The most important touristic objectives in the Rucar – Bran area are: the Dambovita quay, Dambovicioara Cave (which has electrification) and Uluce Cave (on the Cheia Valley). Moreover, there are many routes along the valleys or alpine routes with beautiful landscapes, and which also offer the tourist the possibility of covering the distances by bike. Read more about Vlad the Impaler (Vlad Tepes) the real Dracula. Two months ago I traveled to Romania alone, it was amazing the bran castle! I mean the structure inside is so complexed and even I could get lost! P.S the food outside called “Langos” is delicious! !Especially the one with cheese!!!!! It costs only 6 lei!!!!! is it accomodation exactly in the castle or?? if, how much it costs?? 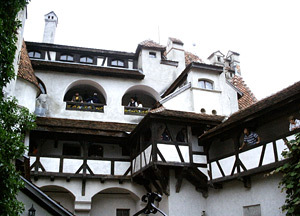 Visited Bran Castle few monthes ago. it was AMAZING!!! I was born in Bran and came to the US in the early 50’s. Last year was my first trip back in 60 years and I just couldnt hold back tears to see my beloved Bran castle again. I think that Bran Castle is beautiful! I hope that some day I will visted Bran Castle. The hotel bucuresti I stayed at is called Avis Hotel, the staff is very nice. I can´t wait to come back for a visit. I have beauty spots like draculas bite, the 2 markksleft after a bite, 2 on right side face 2 on bottom left hand neck 1 were i can get bitten 1 were a lady has a bra 1 were you have a gun on the waist 1 on my right hand. We are out here in Romania now. Went to Club Dracula on Saturday and Dracula’s Castle Sunday – Loved it. 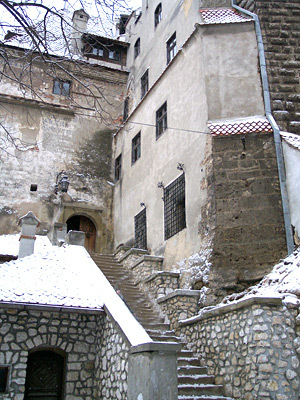 By-the-by, Dracula’s Castle has 57 rooms. Many were roped off so we couldn’t go in. The kids loved it. There was a bear skin on the wall at Club Dracula. I liked the castle. Rasnov Fortress is definitely my favorite from the region. I love it more then Bran or Peles …it gives you that old feeling …u know what i mean . Here’s a Panorama picture : http://i1.trekearth.com/photos/40569/rasnov.jpg and don’t forget to google more ” Rasnov Fortress ” ..and i forgot to mentions , this one also has some scarry stories …try it :). My grand father came to america in 1906 from Reussen, in Transylvania. He told me of this and other places in Romania. His village has a church that has a steeple that is leaning several degrees. Since the politics of Romania has changed, I had hoped to return to his home village and see this and to see his house, which is still standing. Since my health has failed, my travels will be confined to photographs. If anyone has any to share by email, I would be grateful. I wish to pass on my family history to my grandchildren and photos would be a great way to do so. Does anyone know how many rooms are in dracula’s castle? Nice pics of this castle. One day I’ll come visit this place. 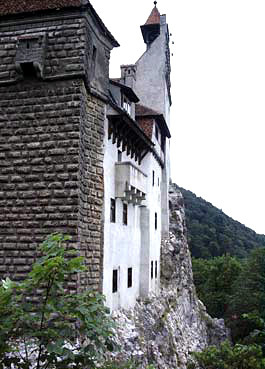 Just looking at the pictures of Bran Castle evokes a sense of ‘being there before’ – yes, I have Romanian ancestry from the Hapsburg & Hohenzollern people on my Moms side of the Family. Although spending time in Hungary (Kapsovar & Taszar) I was unable to visit Romania; however, the day will come when I’ll return! Thank you for putting this up online – you did a great job! I think if you spend any time studying castles, you will eventually come away from the Hollywood image of cold stone walls. The usual castle you see is a ruin and all of the interior plaster, etc ahs been removed, or weathered out. Calstles such as this example are far closer to how they were originally, than some might think. They were the homes of the wealthy and no expense was psaared to make them comfortable, Wood paneling, ornate plaster, carved stonework, stained glass, all were an integral part of a castle. I mean when you look at it you don’t see those ages but new century. i’ve studied it for at least three years and i thik that he was not a vampier but still verry feared and the people new he was not vampier but was still frightened by the deaths and dead bobbies hanging every were .